I truly saw how deep our weakness goes as I saw you struggle through the last week. I am so blessed to see you raised in His power as you continually become strong. …and I was reminded that DAVID means BELOVED. God, and Dad, have faithfully seen you through this, and I am grateful from the bottom of my heart for my two Fathers who demonstrate unconditional love – true love – to you, and to our family. Soon Dad will be picking up Spicy Tuna from Sushi on the Run in Aptos for you, Mom, and you will feast on it and whatever else your heart desires. How quickly things have changed. I never would have guessed in February when my mom’s cholesterol spiked that the valley of the shadow of death lay ahead. Yet, here we are. We don’t know the outcome, we only know that our happy lives in which we were steadily plugging along have forever been altered. Right now, my mom is resting in sedation, experiencing “rebirth” – healing…struggling. But it is not in vain. Because we know suffering produces perseverance; perseverance, character; and character, hope. (Rm 5:3&4). When I woke up this morning, my mom’s smiling face greeted me as it does every morning from the picture I put up of her beside my bed of her smiling at Thanksgiving dinner. As I smiled back at the picture and thanked God for blessing our family by healing my mom, I basked in the Peace of God and a vision of a cocoon settled in my mind. We: my dad, mom, sister and I, have been living the life of happy fat little caterpillars, plugging along enjoying the Fruits of The Spirit: Love, Joy, Peace, Patience, Kindness, Goodness, Faithfulness, Gentleness, and Self-Control (Gal 5:22&23). God has truly met all of our needs and blessed us beyond anything we could imagine. Now with our present sufferings we are in a waiting space…everything has changed. We are in a cocoon: the valley of the shadow of death, being still, knowing He is God, resting in trust and obedience, awaiting metamorphosis. 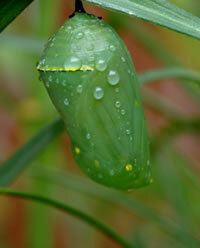 The restricting cocoon and struggle required for a butterfly to get through the tiny opening when it is time to emerge was by God’s design to force fluid from the body of the butterfly (once a fat little caterpillar) into it’s wings so it is ready for flight once it achieves freedom from the cocoon. God does not give His children anything we cannot handle. Trusting Mom will be home for her Birthday – healing, is the Hope that we have. Right now my mom needs Prayer Warriors to rise up and request of the Lord to work a miracle that she will not need pain medication. The medication dosage needed to provide relief to her agonizing bones tears up her stomach. Even at total health my mom was hesitant to take ibuprofen because it reacted uncomfortably with her stomach. Please request of God to work a miracle for her to rest comfortably without further abrasion to her body so she can heal. It is also my prayer that she will be able to rest comfortably with the humidifier on her face to help her breathe. Her mouth and throat are dry from the Chemo, and although the humidified air would help, she doesn’t like the tubes, and elastic that is constantly stuck to her. Just rest mom, rest and let God heal you, he accepts our prayers, and has heard our cry for mercy. O LORD, heal [her], for [her] bones are in agony. 3 [Her] soul is in anguish. save [her] because of your unfailing love. 5 No one remembers you when he is dead. and drench [the] couch with tears. the LORD accepts [our] prayer(s).